Future Pinball only supports Led-Wiz, so that's why I went this route instead of a USB controlled Sainsmart ...and also for 10 solenoids, plus more toys in the future. 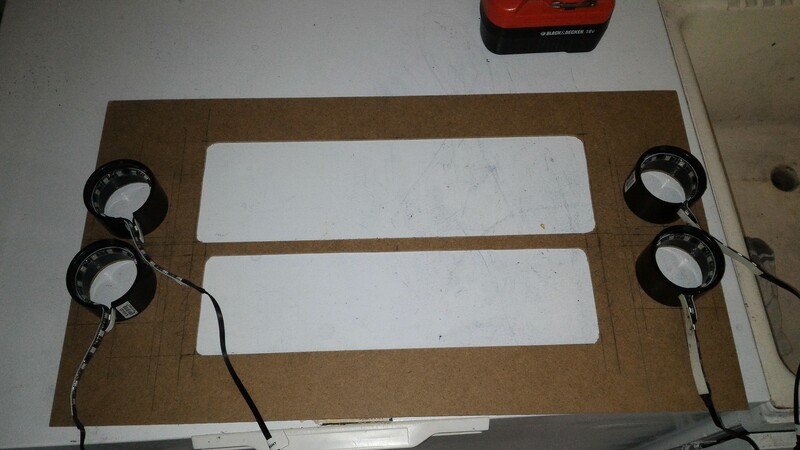 As for the addressable led strips and matrix..... there's WAY too much information for me to post here for a tutorial. 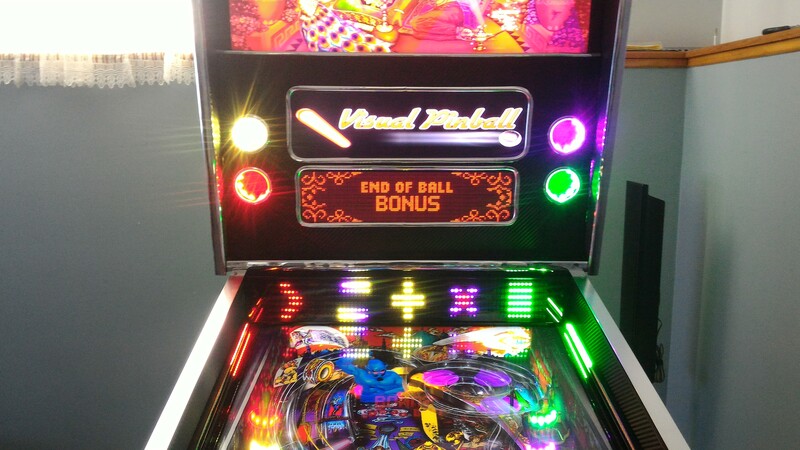 It ONLY works with Visual Pinball and Pinball X because it works through Direct Output framework. 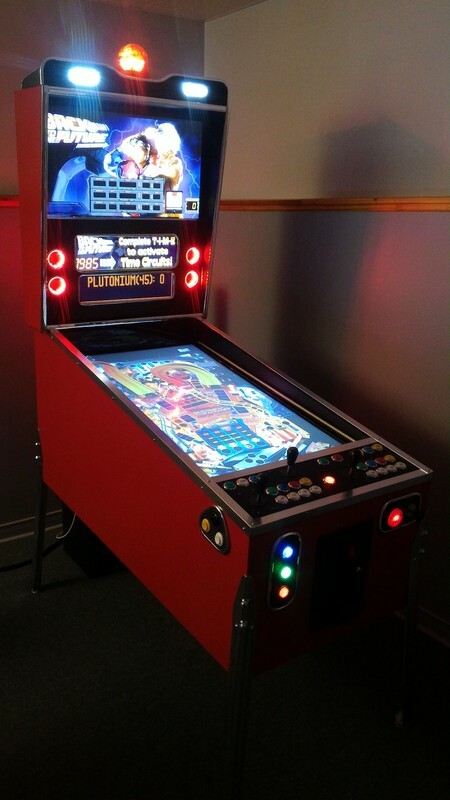 ok so i just want to use it for pinball x table selection not future pinball. I like the strips on the side mainly. You would still need to install DOF and get that software up and going first. 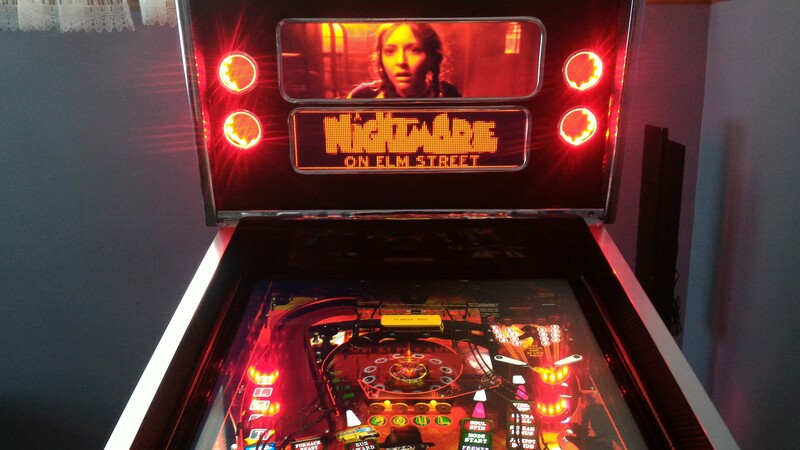 You pretty much will need to get Visual Pinball up and running to be able to test that out most likely. So you used, 16 relays, a teensy and a led wiz correct. I'm trying to see what all i need to buy. You would also need a separate 5V power supply good enough for how many LEDs you would use, and its recommended to get a separate 12V supply (for Sainsmart, solenoids, normal LED strips if you use them, etc) as well to protect your PC. Ok thats where you confused me, you said no octocouplers in another post. To be clear, i dont want to use this function for any table, just for table selection in pinball X. The shapes, with the side leds is all i want during table selection. So do i still neds dbs2 and visual pinball setup just to do that. 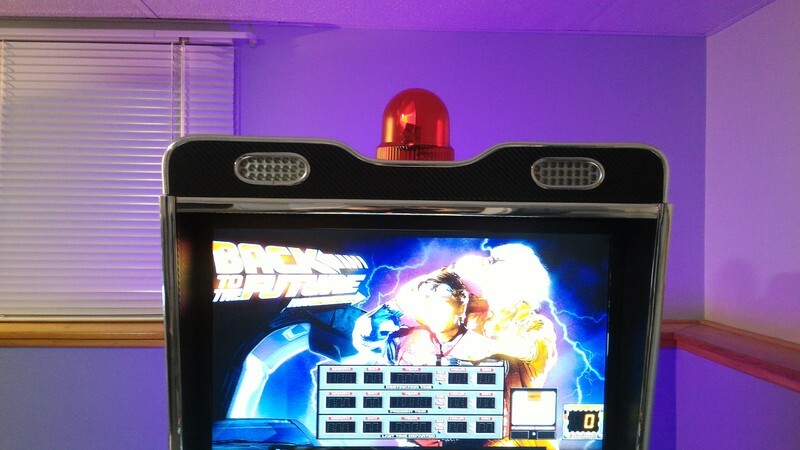 I'm just going to run Future pinball only in this cab for now. When I refer to no Octo-couplers...that is referring to not requiring an Octo-coupler circuit to trigger solenoids for your flippers in programs that don't use LED-Wiz or DOF (PFX2, TPA). That's why the program DOFFX2 is a big deal, because you can just do it through software instead of having your flipper buttons wired to a separate Octo circuit that triggers the solenoids and your gamepad / controller at the same time, ALL the time. However, that means I have to replace it with a new monitor / TV. I have to figure out how to mount this new screen. Old one was a 5:4 monitor with no vesa mount at all, new one is a 16:9 TV. I have to make a new bezel to fit this new screen. I have to re-do all my media to fit the new bezel. Future Pinball tables all have to be re-edited to fit the new bezel's 4th display area. I may re-do the speakers into 4 holes to better accommodate my RGB "flashers". I'll have a monitor that will be much easier to remove. I can hear you guys screaming.... "Dude, get a real DMD!" If I put a real DMD into the back of my cabinet, there would be ALOT of unused space left as I can't fit another screen and a DMD into there. It really would look odd, and I'd hate it. Also, I really like having that extra "display area". 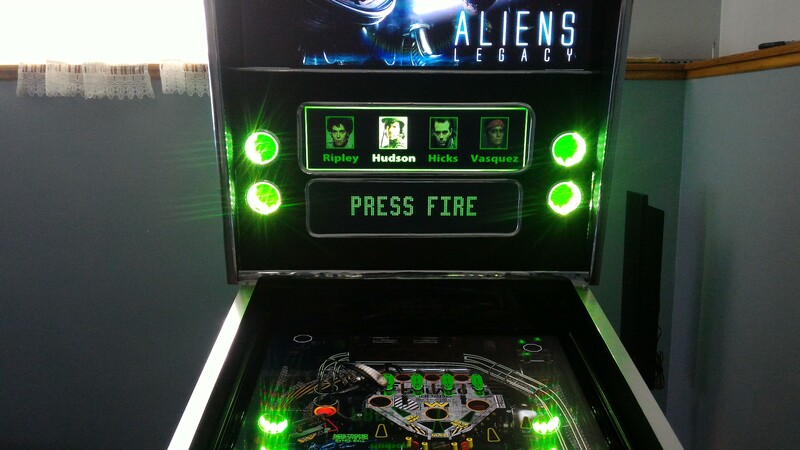 Especially for MAME and Future Pinball. Also, the cost of a DMD even with DIY would cost alot more than this new screen which was real cheap and looks great. Alot of work to do now....but once its installed I WILL show some gameplay footage of VP with the addressable LEDS and matrix, before re-doing all the other stuff. Disaster strikes.... a new look emerges! OK....so my middle "dual" screen which was a 5:4 monitor died on me (after 10 years of service). I now needed to get a new middle screen, and I had to re-build my bezel and speaker arrangement to accommodate it. I decided to go with a 19 inch 16:9 TV. It fit nicely and was the widest I could go....the colours were really nice....it was only $80 CDN new...and unlike the previous monitor which was a ---smurfette--- mount, this had a standard vesa mount. It also had 1:1 pixel mapping which made for a perfect crisp image. After a bit of work, I was able to get to get it mounted in a way that could easily be adjusted in the future if I had to replaced this one. I now had a little bit of space above and below the TV since this is a widescreen monitor. For the bezel, I now had a wider screen space, but that also meant that my speakers would have to be mounted to the farthest sides of the backbox. My "dual" screens would be closer together, and the top half a little bit smaller. Since I had my RGB "flashers" inside my two speaker holes before and really liked how it worked, I wanted to still have that.... but I didn't like having 2 "flashers" within the same speaker hole. It would end up blending colours and not be distinctive enough. I wanted 4 separate "flashers". I figured, since my left and right speakers each have 2 smaller speakers...then why not have 4 speaker holes in the bezel! ....then I cut the bezel out of thin backboard, and hot-glued a RGB LED speaker spacer at each hole (after putting on carbon fibre vinyl wrap and automotive car trim in each hole). ....and voila! 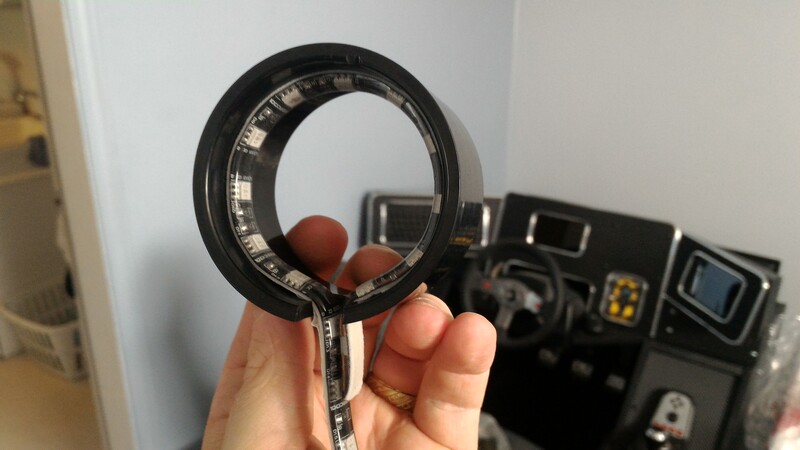 Let there be discrete 4 RGB "flasher" lights! Each speaker hole is now the Outer Left, Left, Right, Outer Right RGB flasher (center flasher is backbox backlighting). You'll notice that the LED matrix below has 5 shapes. These are actually the equivalent of the 5 RGB flashers that is displayed for this table. (the shapes can be anything, I was just testing) Notice they are matching in colour with the speaker holes. 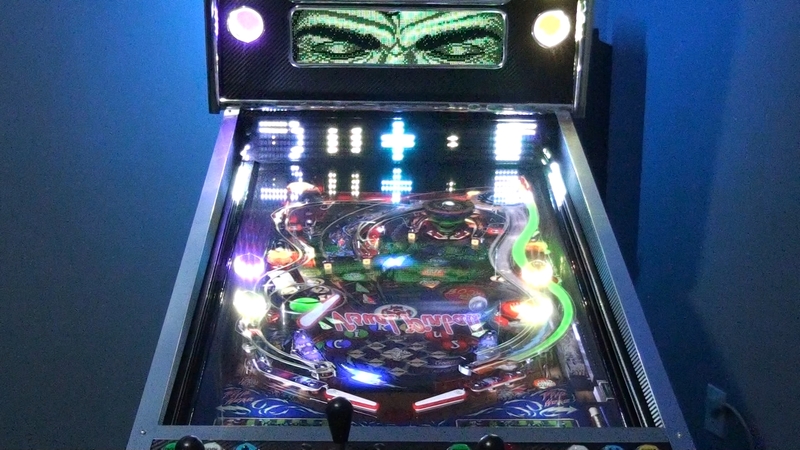 You'll have to excuse the squished Visual Pinball logo. 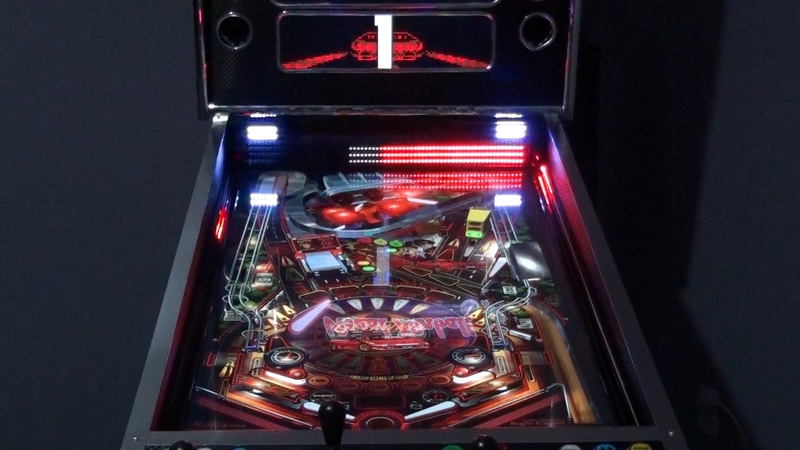 Since all of my Pinball X "dual middle screen" media (which is one single picture or video) was created with a 5:4 ratio, it now all has to be re-done to look proper with a 16:9 ratio. 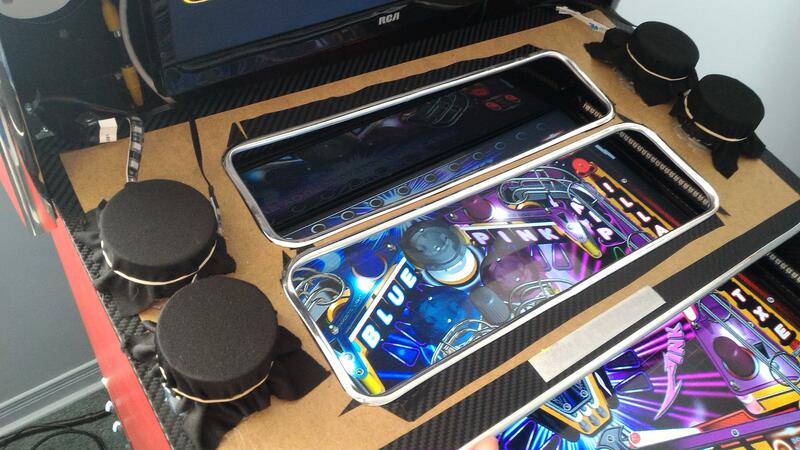 Future Pinball tables will all have to be re-edited again, to have all the elements (movie clips, scores, gadgets, etc) to fit the top of the middle screen. 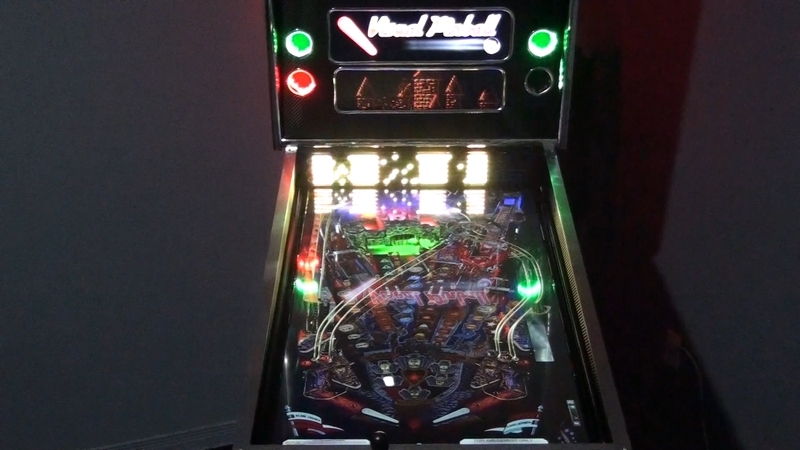 What you have seen in my Future Pinball videos in Pinball X for that section is not looping videos. Its all bits from actual gameplay within Future Pinball. At first, I thought the 4 holes looked a little weird, but after seeing the lights in use, I love it! The only thing I hate is the fact that I couldn't get the chrome trim to make a perfect circle. ....and it sounds better too! 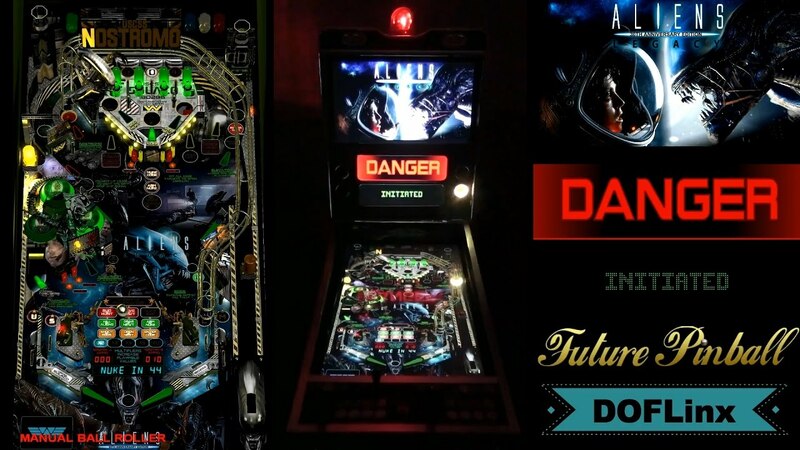 Visual Pinball Addressable LED Matrix Gameplay Videos! They are finally here! I said a while back I would get around to showing some videos of VP gameplay and effects from addressable leds through DOF....so here they are! Unlike the rolling effects while browsing in Pinball X, these are different things that occur from various tiggers throughout gameplay. Explosions, looping effects, rocket trails, sparkles, symbols, shapes....all sorts of things. Please note: this was the best angle I could get that would still show all 3 sections of the addressable LEDS. The brightness of the LEDs can also be adjusted...so you don't need to worry about being blinded while playing! I apologize if I seem to repeat myself a few times....the damn power kept going out while I was recording, so I lost track of what I said in earlier videos. This first video shows Bride of Pinbot and Attack From Mars. Lots of different types of effects shown.... I continued to make other videos, even after the power goes out at the end of this video! This second video shows off some explosion effects, trail effects, and more. Tables shown are Medieval Madness, and Monster Bash. This third video shows some cool looping effects from The Getaway, as well as the neat effects in Star Trek and Circus Voltaire! Beacons, Strobes, RGB Bar, and more effects! 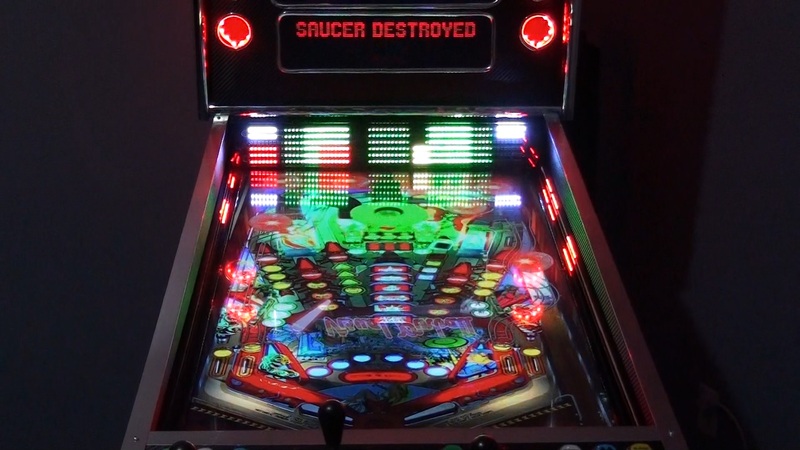 This last video shows ALOT more tables, and demonstrates how the various lighting toys in a pinball cabinet can be replicated by the back matrix! Also shows some other effects. Tables shown are NBA Fastbreak, Jurassic Park, Scared Stiff, Tales of the Arabian Nights, Transformers, Twilight Zone, and Star Wars. I hope these videos do justice in showing off the hard work from everyone involved in making these effects possible! If there is something specific you want to see, let me know and maybe I can put up more videos! 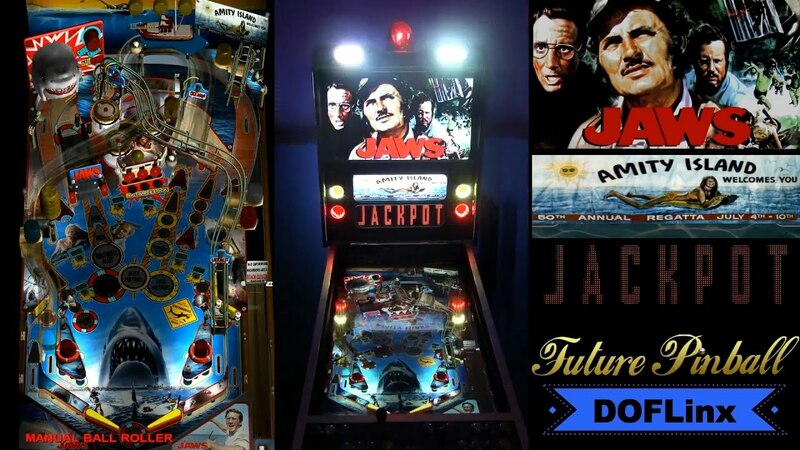 SLAMT1LT, better known for creating some of the best Future Pinball tables out there (original, recreation, modded, etc) has mentioned my pinball cabinet (saying "this is how his games should be played, etc...") on his website's main page, and linked one of my videos at the bottom where you see the featured videos. Link to his website is here. Keep in mind that the main page changes all the time, so you may not see "the mention" anymore depending on how long its been. Either way, it's worth checking his page out, as its where you will see the newest versions of his fantastic tables. remove the 's' from https, add brackets to the front and end, only way i could get the code to show up. Here is a demo of the new program DOFLinx (formerly DOFFX2) by DDH69. I've been beta testing it for a while now. 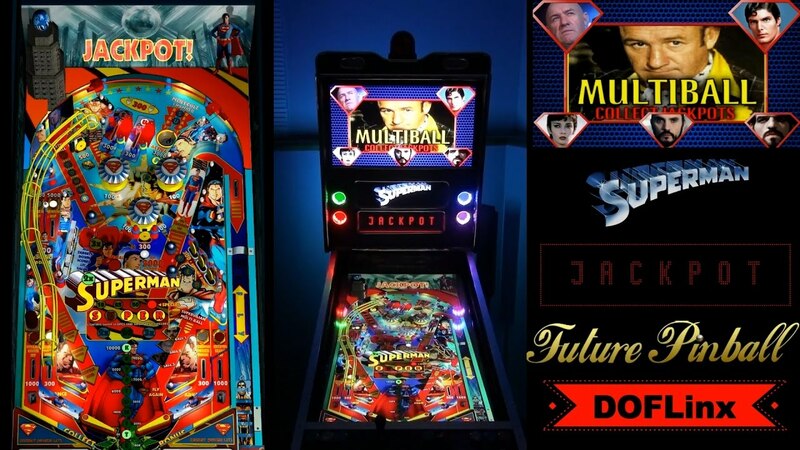 This program has many more features and now provides full true feedback for Future Pinball using DOF. This means support for all of the modern pinball cabinet toys, lighting and feedback for Led-Wiz, Sainsmart USB, PACLED64, and KL25Z. I can only pray that one day that can happen! 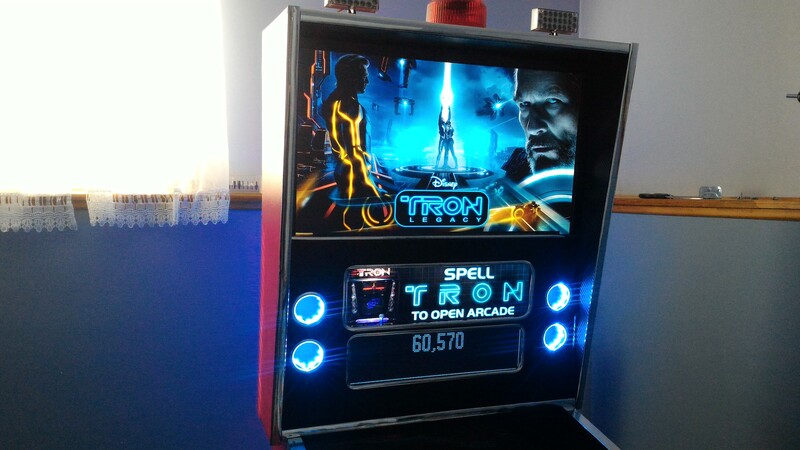 You have never seen a Future Pinball table with this kind of feedback and lighting in a cabinet! I made use of some combined effects like shaker / blower fan / lights. I had to use 14 Timers and sub routines to match up some effects with video clips. The table is a bit hard....but if you can progress, you'll be rewarded with a nice light show and some good feedback. I've uploaded the table to PinSimDB....just waiting for a mod to approve it. 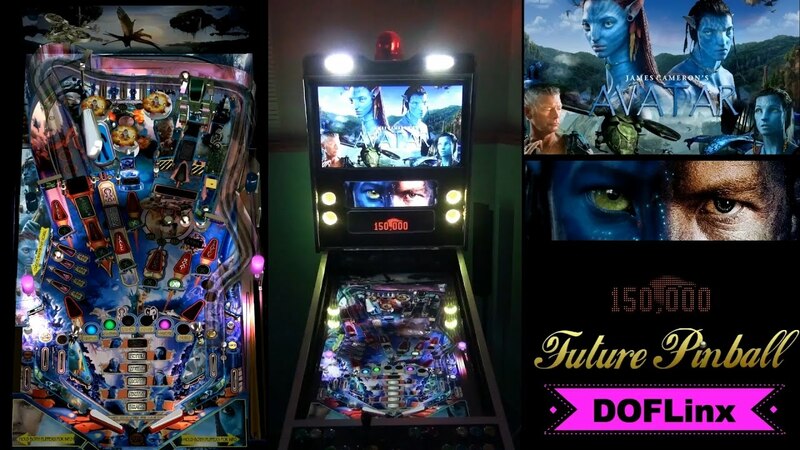 Well, here we go with another great Future Pinball original table being given the DOFLinx treatment! 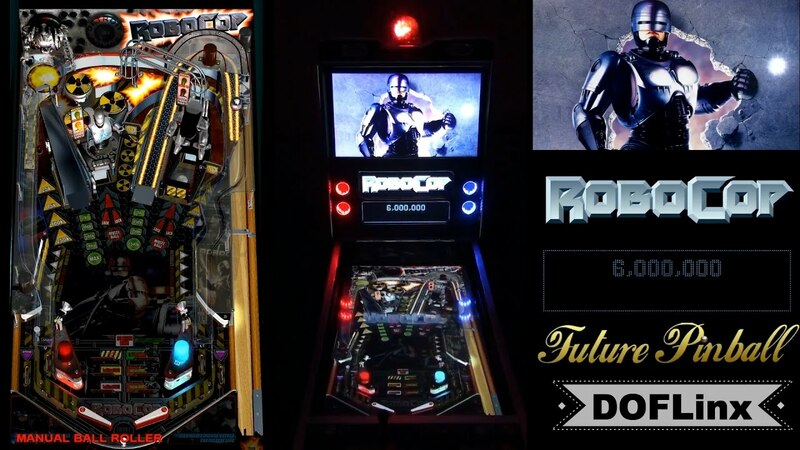 I present to you.... ROBOCOP (Ultimate Edition) (DOFLinx - Cabinet Edition)! This was another fun table that is REALLY cool to play with alot of modes. The videos and sound combined with the flashing lights and feedback really make a difference! I made use of some combined effects like shaker / blower fan / gear motor and flasher lights. It's getting alot easier to add DOFLinx support, though I spend more time testing, then scripting. Man if you guys figure out the addressable leds for FP, you will be legends. I'm still waiting on solenoids, they lost my first order. In the mean time i've been making pinball FX all pretty with custom DMD titles and finding HD videos for each game. I tackle one table a night. I'll be adding your tables to the arsenal soon, thanks for all of your help and support. Pretty much all of SLAMT1LT's tables are on my list ...the only reason TRON LEGACY isn't done yet is because I know SLAM is updating it again...just don't know when he will release that...it could be a while. Tron and Avatar were among the first I wanted to do...I was just focusing on his more recently completed updates to his tables. If DDH69 (who created DOFLinx) had addressable leds...it could happen.....but it's hard for him to add that support in when he can't even test it. He just now got his RGB flashers and other lights. This is another fun table that is now even better thanks to DOFLinx. I made the RGB under cabinet lighting change based on events during play: Krypton Ball, Tilt, Fight, etc.. 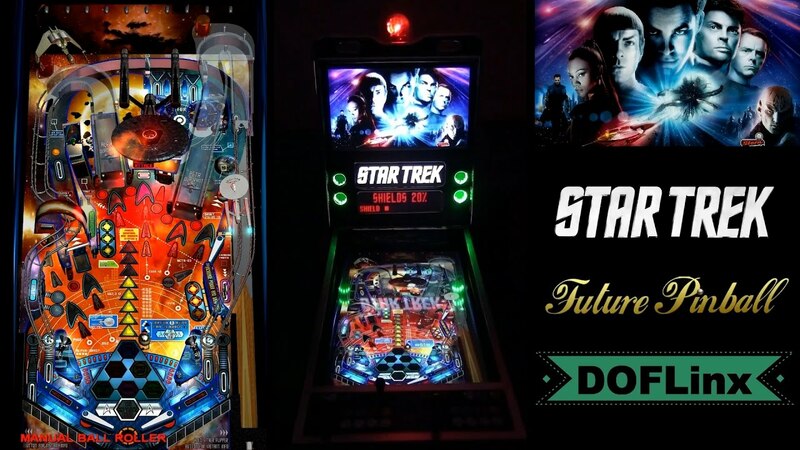 Here we have another fine Future Pinball table given the DOFLinx upgrade! 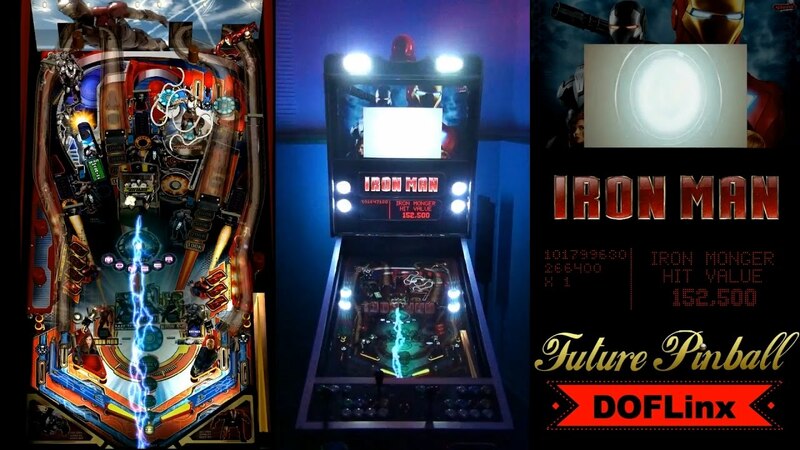 The ULTIMATE Iron Man pinball cabinet experience! It's crazy.... there's over 1000 lines of DOFLinx commands and my own code that I put into this table! Thanks... I love this table. 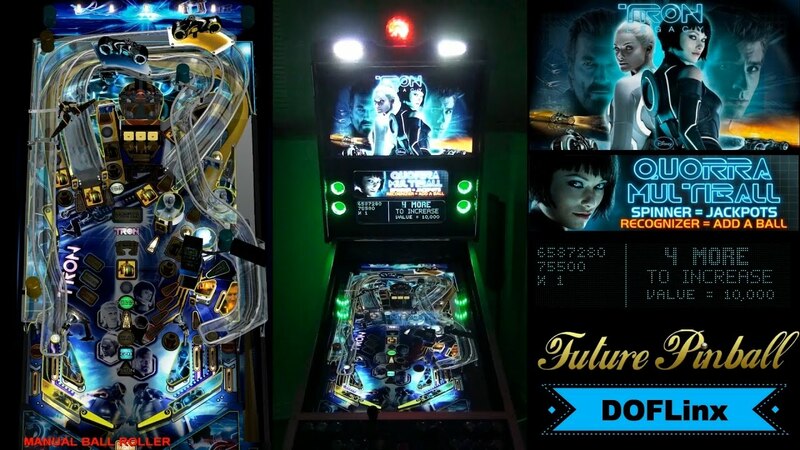 This is some serious badassery going on in the virtual pinball world and I can't wait to get involved. Vpin work is a couple projects back but I have been following your build on youtube for a bit now. If you haven't watched them yet...look at the addressable led demo videos a bunch of posts back in this thread. They are amazingly cool, and I hope that Future Pinball will get support for them one day! ...but yes...I'm breaking new ground here. 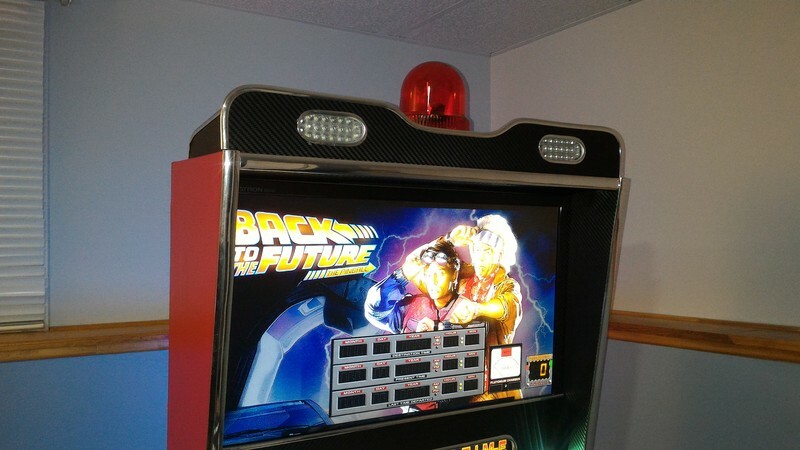 When have you ever seen animated flashers combined with feedback devices used in a pinball cabinet this way? I love it! No matter how much work I may put into a table, it's always the machine gun and explosion effects that everyone likes. I want to make something like this. For starters, what frontend are you using? How much did it cost in Canadian dollars? I'm in the US, so I need to convert to US dollars. Nice rig!!!!! Front End is Pinball X. Cost....well I can't give you an accurate total as I just kept adding stuff in over a year.... maybe anywhere between $3000 to $5000? 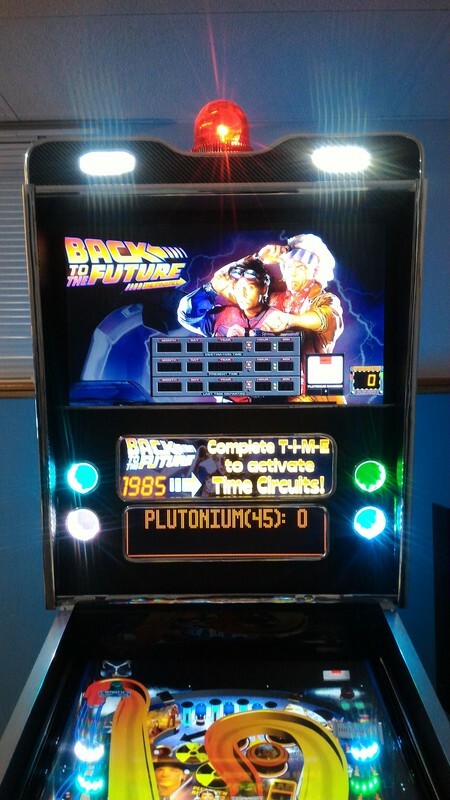 I already had alot of the electronics and the cabinet was made from scratch. The only real pinball parts I used were the legs, plunger, and launch button, and the coin door was a cheap smaller door. But do you play it? And, if you do, do you enjoy it, or are you finding things that need improved? ...always find new things I would love to do with it, and I'm always tweaking things. Yeah this new setup is not your normal vpin. Just the new software adds alone, I play mine all the time and its not even in a cabinet yet, the effects are enough to keep you interested. 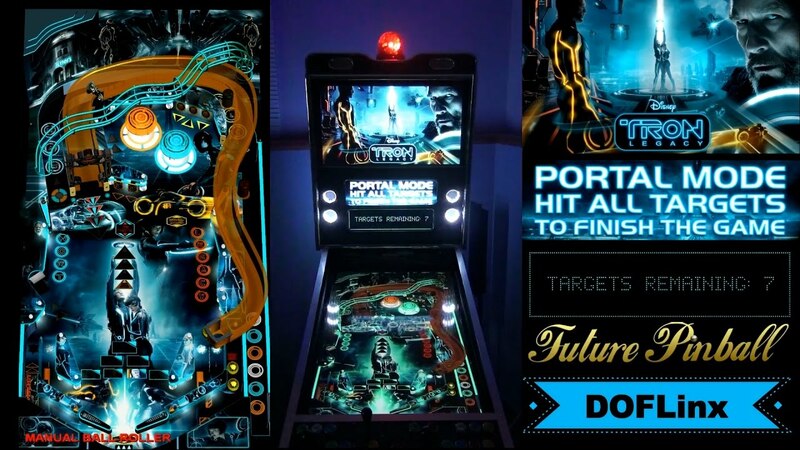 .... virtual pinball presents opportunities to create games, or contribute to helping to make parts of pinball games. Sadly....starting next weekend, i will be away from my cabinet for about 4 months for work. Maybe i'll be home on weekends.